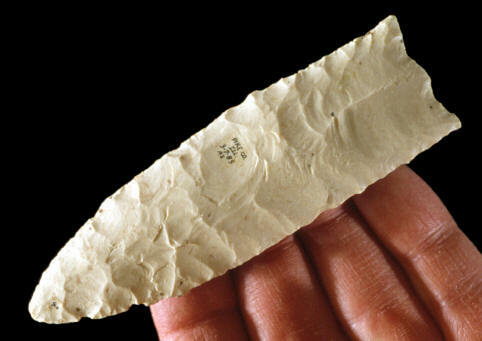 This Clovis point was found on March 7, 1985 in Pike County, Illinois. It's a unique example because it still retains a fluting platform that was never removed. The side that was prepared for fluting (seen in above picture) has two channel flake removals. They are often referred to as guide flakes because they form a center ridge line just below the prepared platform. This technique of fluting was first reported by John Witthoft from fluted points he studied from the Shoop site in Pennsylvania. He named the technology "the Enterline Chert Industry," after the nearby town of Enterline. Sometimes the process is referred to as enterline fluting. H. M. Wormington (1957) describes the technique as: "The usual method, apparently, was to thin the base by removing two longitudinal flakes, and then removing the final channel flake. This sometimes obliterated evidence of the smaller flutes, but in some cases the earlier flake scars are still readily apparent." This point is made of white Burlington chert and it measures 4 1/16 inches (10.3 cm) long.